President Hosni Mubarak's son has said Egypt must offer a new political vision for the Middle East - one not imposed from outside, but based on Arab values. Gamal Mubarak, a senior figure in the governing National Democratic Party, urged the rejection of "foreign ambitions" trying to shape the region. 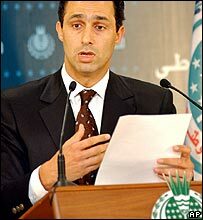 The remarks were seen as a reference to efforts by Egypt's US ally to introduce Western-style democracy in the region. Mr Mubarak was speaking at the start of NDP's annual conference in Cairo. "We reject these foreign ambitions to erase Arab identity in the framework of what they call the Greater Middle East initiative," Mr Mubarak said. He opened the conference in his role as head of the NDP's political committee and assistant secretary-general of the party. During the lengthy address, his statement that Egypt should consider developing nuclear energy was met by loud applause. Correspondents say Mr Mubarak is trying to establish himself as an important political force, which could put him in a position to succeed his father. The younger Mubarak has consistently denied having ambitions to rule the country, and his father has always distanced himself from a "dynastic" succession process.